UPDATED: Sat., July 28, 2018, 10:05 a.m.
BARCELONA, Spain – Taxi drivers in Barcelona are blocking traffic on a major thoroughfare as part of an indefinite strike to protest the use of ride-hailing apps like Uber or Cabify. Hundreds of taxi drivers parked their back-and-yellow cabs in the middle of Barcelona’s Gran Via on Saturday, where some drivers spent the night in their vehicles or in tents. Catalan public television showed taxis from other Spanish cities, including Bilbao, 372 miles away, arriving overnight to join the protest. 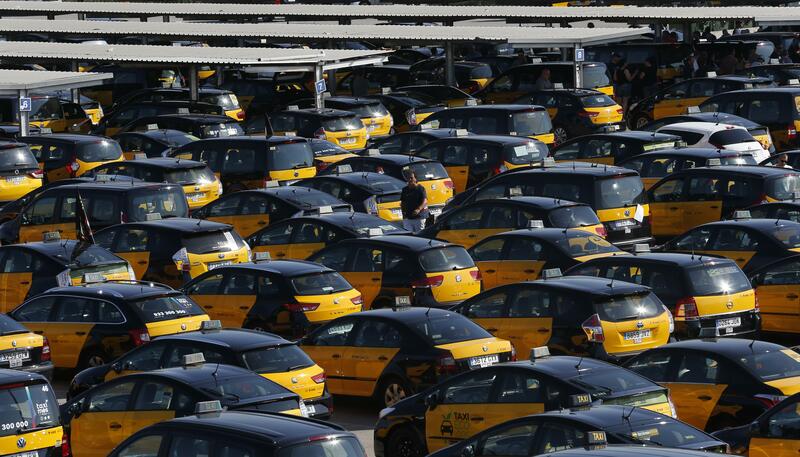 Taxi drivers in Barcelona started the strike Wednesday to oppose a judge’s decision that suspended the need for additional authorization for ride-hailing companies to operate in the popular tourist destination. Uber and Cabify suspended services Wednesday after taxi supporters assaulted several of their drivers, sending two of them to the hospital. Published: July 28, 2018, 10:02 a.m. Updated: July 28, 2018, 10:05 a.m.